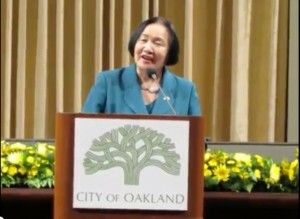 Last month, when Oakland Mayor Jean Quan gave her annual “State of the City” address, the 10K2 Plan was the only major, new initiative that she announced. With an election coming up in November, and faced with persistently low approval ratings, she clearly hoped that it would help her persuade voters to give her a second term. Under the program, she pledges to add 10,000 units of housing to Oakland—25 percent of which will be affordable—at some time in the future. Quan’s policy is designed to appeal to people with interests that are typically counterposed. On the one hand, the addition of 7,500 units of market-rate housing will be great for the wealthy tech workers pouring into the region. These are the people who can pay thousands upon thousands each month for a small apartment and who are driving up housing costs, by all accounts. On the other hand, the addition of 2,500 units of affordable housing will be good for poorer residents; these are the people who can’t pay high rents and are being pushed out in droves. On top of all this, the expansion of the housing stock will put some downward pressure on housing prices generally, enlarge the city’s tax base, and create some new jobs. Apparently, this is a win-win-win policy. Quan looked unusually confident during her presentation, as if she knew that she was scoring a political victory, and pundits gave her performance high marks. The East Bay Express immediately lauded her plan’s environmental aspects. Zennie Abraham, one of her harsher critics, said that she had “finally found her political legs” and grown from an “accidental mayor” into a “real mayor” who understands what it means to exercise power. Her odds of winning reelection started to look a little better. In some respects, Quan is merely rebranding and taking credit for a construction boom that is already underway but, still, she has presented this as a plan and we should assess it as such. The issue that Oaklanders need to consider when doing so is this: has she found a way to increase the city’s housing stock, make space for those driving displacement, while also protecting the working class’s ability to live in the city? Can Quan actually perform this magical balancing act? The answer to all of these questions is no. Although the 10K2 Plan contains some modest measures intended to mitigate displacement, it will necessarily make the city more of a place for the rich and the rich alone. There are two reasons for this. First, the 10K2 Plan embraces an economic model that has been ruinous for Oakland’s poor and urban areas throughout the country. After deindustrialization and “white flight” gutted the city in the mid-twentieth century, planners and policy makers have set out to rebuild the city’s economy around shopping, entertainment, and housing. We see this not only in the 10K2 Plan, but also in Quan’s boosterism on behalf of local sports teams, the hotel and restaurant industry, the monthly Art Murmur gatherings, etcetera. These things generate some jobs (and some tax revenue), which politicians are quick to celebrate, but the jobs are low-end service jobs that are almost always insecure, lack benefits, and do not pay salaries that could support the rental or purchase of a market-rate home in Oakland. The 10K2 Plan embraces this model and, as such, furthers the city’s commitment to an economic form that more or less guarantees that its poor will remain poor and have to go elsewhere. Second, adding 7,500 market-rate units will bring many thousand more—let’s say 15,000—wealthier residents to the city. These people will push for planning and policy changes that will make Oakland less hospitable for lower income folks. We can expect more parklets, dog parks, and bike lanes, which are great for people with lots of leisure time but maddening for those rushing to get to work. We can also anticipate an increase in heavy handed police tactics, a necessary tool for managing marginalized and discontented populations. Subtly and not so subtly, these things will indicate that Oakland’s streets are not for the working class. In reply to these criticisms, defenders of the 10K2 Plan might argue that at least the low-end service jobs being produced are jobs, which is better than nothing at all. This is a “logic of lesser evils” argument used to bludgeon people into accepting the bad because it is not worse, but Oaklanders shouldn’t have to endure substandard employment or an economic model that pushes the poor from the city. Likewise, Quan’s allies might say that the city can institute policies to ensure that its planning and design decisions express all residents’ concerns, not just the upper class, but this is naive. These new Oaklanders will demand that the city reflect their needs and they will have far greater resources to force it to do so than the poor. It would be unrealistic to expect otherwise. Although Quan was able to deliver an effective stump speech, no one should be confused about the class-bound nature of her 10K2 Plan, such as it is. It portends more displacement not less, despite the presence of superficial half measures oriented toward working class residents’ needs. There are so many things that cities can do—foreclosure prevention, improve rent control, encourage land trust conversion, etcetera—but this is not what we see here. In essence, expanding the housing stock without challenging class inequality will always serve the upper class. Indeed, no politician will ever be clever enough to create a policy that can override the basic class conflict between the rich and the poor that is dividing our society and our city. Quan may try her best, as she fights for reelection, but we should not be deceived. Housing justice and economic equality are inextricably linked. This entry was posted in Oakland by Chuck Morse. Bookmark the permalink.